It looks like it is time to get on with the times with a hardware refresh every single year. From smartphones to tablets and even action cameras, not releasing a new model each year is suicidal. GoPro knows this, which is why the company has decided to move forward from the GoPro Hero5 by unveiling the all new GoPro Hero6 Black, which will set the new bar when it comes to image quality, stabilization and simplicity where action cameras are concerned. Touted to be the most powerful and convenient GoPro ever released, the GoPro Hero6 Black will be powered by GoPro’s very own custom-designed GP1 processor in order to help it achieve a whole new level of performance which includes stunning 4K60 and 1080p240 video, as well as bringing the most advanced video stabilization in a GoPro, ever. 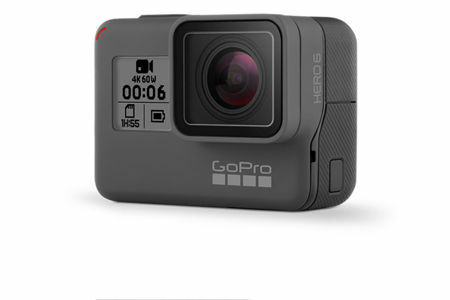 Apart from that, the $499.99 GoPro Hero6 Black will arrive in a rugged, waterproof, go-anywhere design that allows it to venture into the most adrenaline pumping experiences with you without missing a beat. It will work best with the GoPro App that will automatically transform your adventures into cinematic QuikStory videos, which you can then opt to share with the rest of the world. The Hero6 Black has also greatly improved dynamic range and low-light performance in order to ensure that things really look spiffy, while the inclusion of digital zoom helps you get closer to the action if you are physically unable to do so. Even better yet is its ability to be waterproof up to 10 meters, and it captures photos in RAW and HDR formats for a wider range of editing options later on. Just in case you are unable to control the GoPro Hero6 Black with your hands, fret not: it comes with support for voice control in 10 different languages.